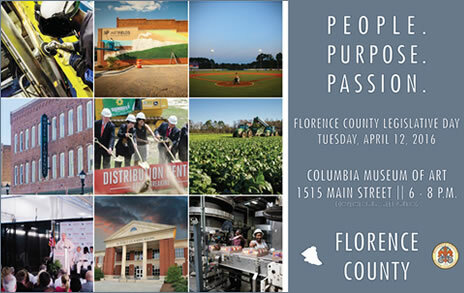 Florence County Legislative Day is always noteworthy and Tuesday, April 12, 2016 was no different – House and Senate members, as well as their staff, legal teams, and all members of Florence County Progress, Inc. were invited to celebrate the People, Purpose, and Passion of Florence County businesses. It was a time to catch up, meet and share ideas with our legislative representatives. Catered by Osbornes of Florence, the Columbia Museum of Art was filled with good food, good friends and lively conversation. Mark your calendars for Tuesday, March 14, 2017.